How old is your globe? Is it less than 50 years old or is it turn of the century or before? Checkout our "Determining the Age of your Globe" article for assistance in dating your globe based on place names, and if it is more than 50 years old visit our friends at Murray Hudson for globes that date back to the turn of the century and before. What is the condition of your globe? If your globe is less than 50 years old and the map is severely torn, ripped or weathered, chances are it will not fetch a whole lot. That is unless the globe contains a unique feature or two that are no longer in production. How is it mounted and what is the condition of the stand? If the stand is in tact and in good condition that is a plus. Having a stand that is unique and/or no longer in production may increase the value. How was it acquired and who owned it? Is there a story behind the acquisition of the globe, who owned it, the purpose for which it served. Was it a globe made for a dignitary or head of state? While these details are not critical in determining the value of a globe, the story and ownership of a globe can make it more attractive to antique dealers and collectors. Names and places of locations, i.e., Country, Capital, City, etc. Many collectors look for specific features on a globe, such as a major named place change or the layout of the landmasses. The landmass display can be unique on very old globes as this was the understanding of how the earth was at that time. 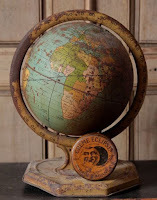 If you are looking for a turn of the century globe, well, they are not cheap as you can imagine. Some companies do produce globes today with period maps from the 15th, 16th & 17th Century. Many of these can be found on our "Old World Globes" page. However if you are searching for an actual globe from a specific period checkout our friends at Murray Hudson.